September 18, 2014 by Ecommerce News. About Statistics with tags Belgium, France, Ireland, Luxembourg, The Netherlands, The United Kingdom. 2798 views. The ecommerce industry in Western Europe is expected to reach 204.7 billion euros worth of sales in 2014. This makes this region, consisting of The United Kingdom, France, The Netherlands, Belgium, Ireland and Luxembourg, again the biggest ecommerce region in Europe. This is apparent from the new Western Europe B2C E-commerce Report, Ecommerce Europe publishes every year. Western Europe accounts for almost half, 49%, of all online sales in Europe. No surprise actually, as this region comprises the UK and France, two of the biggest ecommerce countries of this continent. Last year it was expected the ecommerce market of Western Europe would grow to €173.8 billion, but the total B2c ecommerce industry in this region eventually grew to €177.7 billion. This corresponded wityh a 12% growth compared to 2012. If the online sales of goods and services will indeed reach €204.7 billion this year, a growth of more than 15% would be realized. Ecommerce Europe revealed in its research that 95 million consumers in Western Europe have bought something online in 2013. The United Kingdom is – again – the unsurpassed leader of the pack, as it leads the ways with total online sales of €107.1 billion. That’s 60 percent of all online sales in Western Europe. Predictions are the UK will reach total sales of €127.4 billion at the end of this year. France and the Netherlands rank second and third with expected sales of €57.5 billion and €11.5 billion respectively. These three countries clearly dominate the Western European ecommece industry, but there is still room left for the little players. Ireland is expected to reach sales of €5.2 billion this year, while Belgian retailers will approximately sell products and services worth €4 billion this year and Luxembourg is the smallest ecommerce country, with an expected €529 million in 2014. 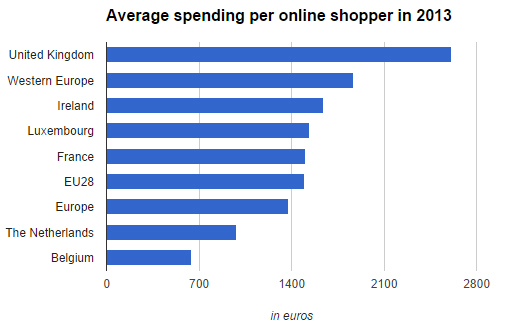 The average online shopper in Western Europe spent €1,867 last year. This is significantly more than the Europen average of €1,376. The biggest online shoppers can be found in the UK, Europe’s ecommerce walhalla. Here €2,614 was spent on average. Ecommerce Europe also looked at the internet penetration and it seems that on average this is much higher in Western Europe (87%) than it is in Europe (74%). The Netherlands and Luxembourg (both 95%) are clearly the Western European countries with the highest internet penetration. More about Belgium, France, Ireland, Luxembourg, The Netherlands or The United Kingdom.